A surprisingly good budget printer from Brother that gives you a great budget option if you want individual colour cartridges. Expensive to run though, so avoid if you print more than a few pages a day. A great little budget printer, the Brother DCP J774dw printer is ideal for users who want scanning and copying in a cheap little printer, and don't print enough for the high running costs to impact them. 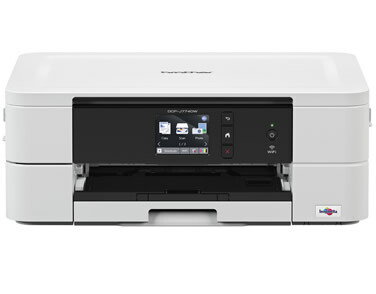 As with most budget printers, the Brother DCP-J774dw comes with a small selection of features that are ideal for home users and cover all the bases you'll need. If you're aiming to network this printer ensure you have a wireless connection, as there's no Ethernet port for you to use. The printer is also tiny, coming in at just 15cm high, 40cm wide and 42cm deep. It will fit on nearly any shelf or desk, making it ideal for tight spaces. 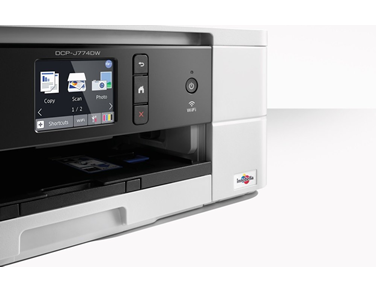 The Brother DCP J774dw came in faster than we expected, reaching around 10 pages per minute (ppm) for normal documents and 7ppm for colour prints. It's a decent speed for printers in this price range. Even 6x4 photo prints came out in around a minute, not too shabby at all. We would note the printer is quite loud, as is fairly common with budget printers. There's a fair amount of whirring and clunking when you print. Quality itself is strong, with good text prints lending the DCP-J774dw to home documents especially. Colour production is good and photos hold up okay, though we do prefer the HP Envy 5540 results if you're focusing on colour printing more. Overall, the DCP-J774dw has good quality and is likely more than good enough for what you need, but check the HP out if colour prints are important to you. 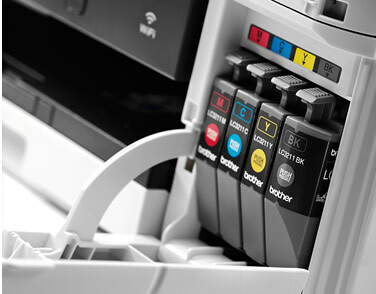 One of the major advantages the Brother DCP J774dw has over other budget machines is the use of four individual cartridges instead of a combined colour ink. This limits any waste you incur by burning through just one colour, and you only need to order the inks you need. These inks are part of the LC3213 Brother range of inks, coming in standard and high capacity ranges. Don't let the "high capacity" name fool you though, these are tiny yield cartridges, with the high capacity only going up to 400 pages per colour. This is tiny compared to other home printers, reinforcing just how focused this printer is on budget users. If you print more than 50-80 sheets a month, do not buy this printer, as your costs will quickly mount up. Those running costs are competitive with other printers targeted at the budget market though, with genuine Brother inks coming in around 3.1p per page and compatibles at 2.7p per page. Home users who print occasionally, that aren't after mainly photo prints, and need to buy a cheap printer. Anyone printing more than 50-80 sheets a month should avoid it due to costs, otherwise the Brother DCP J774dw is a great little home printer choice.